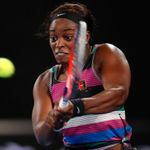 Defending champion Sloane Stephens was sent packing from the Miami Open on Sunday after a 6-3 6-2 loss to Germany’s Tatjana Maria in the third round. The 2017 US Open champion had no answer to Florida-based Maria’s slices, chips and lobs and suffered a second consecutive early exit after losing her first match at Indian Wells to Swiss qualifier Stefanie Vogele. Stephens won the pair’s last meeting in Cincinnati last year but the American struggled throughout in Miami, making 37 unforced errors as her title defence came to a premature conclusion. “I could not be happier right now,” Maria said. “I think I played at home, because I live here. It was helping me a lot. World No 3 Halep avoided becoming the third major player to exit the women’s draw in two days after world No 1 Naomi Osaka was stunned by Taiwan’s Hsieh Su-wei and Serena William withdrew with a knee injury. “I didn’t realise that until after the match looking at the stats,” said Williams, who was broken four times. “I’ve never had a match before like that in my life. “I think in a lot of the matches we played before, she was just on top of her game, couldn’t miss. Elsewhere, Latvian 11th seed Anastasija Sevastova suffered a surprise 1-6 6-2 6-3 defeat to Kazakh Yulia Putintseva, while Australian Open semi-finalist Danielle Collins went down 7-5 6-1 to China’s Wang Yafan.